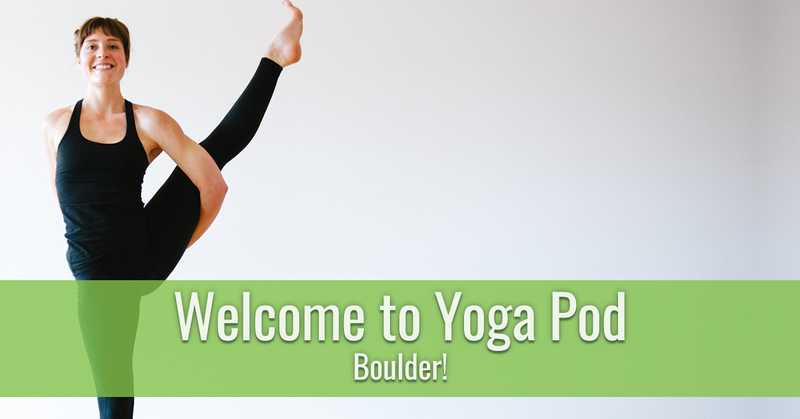 Welcome to Yoga Pod Boulder! If you are looking to join a yoga studio that welcomes students of all levels and prides itself as an inclusive community, Yoga Pod Boulder is the place for you. Located just a few blocks away from the University of Colorado at 1890 30th street, Yoga Pod Boulder is convenient for students and Boulder residents alike. As the flagship Yoga Pod studio, Yoga Pod Boulder is committed to providing an environment where all yoga students can strengthen their practice, commit to self-care, and connect to a supportive community. We are locally owned and operated, so we know exactly what the Boulder area needs when it comes to a yoga studio. We started this blog to provide information to current yoga students and anyone interested in developing a yoga practice. We will cover the benefits of yoga, answer frequently asked questions that beginner yoga students have, and explain different types of yoga. We hope that this blog is both informative and inspires you to unroll your mat at our Yoga Pod Boulder location. What Sets Yoga Pod Boulder Apart? It’s one thing to say we’re a welcoming community, but it’s another thing to live and breathe this into our yoga studio. Our students come to their mats for a million different reasons, and we want our class selection to reflect the diversity of purpose and experience that our yoga students have. podBASICS: podBASICS are designed to teach foundational tools and techniques for a safe yoga practice. These classes are aimed toward beginner yoga students, as they move at a slower pace and feature more instructor demonstrations. Expert yogis can still benefit from this return to basics and a renewed focus on safety and alignment. podFLOW 1 and 2: podFLOW classes are a traditional vinyasa flow class, where we link one breath to one movement. In a podFLOW yoga class, you can expect to flow through a moving meditation set to music and with a knowledgeable instructor. These classes are suitable for all levels. podHOT: True to the Bikram style of yoga, podHOT follows a set sequence in a room set to 105 degrees and 60 percent humidity. For anyone who wants to detox, build strength, and create balance in the body, podHOT classes are a great option. Just be sure to come hydrated! podFIT: Think of this as more of a high-intensity training class. We work all muscle groups of the body, focusing on body weight exercises and cardio, and then finish with stretching and a cool-down. Be prepared to work hard in this vibrant, high-energy class. YIN: YIN classes involve deep muscle stretching in a cooler room. Unlike active podFLOW and podHOT classes, yin classes work on your body’s fascia, or connective tissue, by holding stretches for anywhere between 2-5 minutes. We provide straps, blocks, blankets, and bolsters to maximize your comfort during YIN classes. These yoga class types are the staple of Yoga Pod Boulder, but we also offer specialized classes and workshops such as silent flows, Earth Ways yoga, and vin-yin (a vinyasa and yin combination). Sign up for $30 For 30 Days of unlimited yoga to try our array of yoga class types! One-size doesn’t fit all for anything, especially yoga memberships. Our flexible membership options set us apart and show our commitment to our yoga students. Signing up for a Prema Membership qualifies you for unlimited yoga, and we offer both annual and monthly rates for this membership type. If unlimited yoga is not the best option for your lifestyle, we also feature 10-class passes and drop-in classes. For those who take yoga classes to supplement other physical activities or have a really busy weekly schedule, these class packs are a good option. Additionally, we offer a Karma Yoga program where you can earn a free membership in return for weekly cleaning shifts. If joining a yoga studio represents a financial burden or you want to become more involved in the community, you should consider this option! Be sure to ask about our membership options at Yoga Pod Boulder — and don’t forget that new students are eligible for $30 For 30 days. That’s just $1 a day for unlimited yoga!